Jumplead uses a contact’s behaviour to rank level of interest automatically. This allows you to define the activity that is important to you in signalling your lead's current level of qualification. 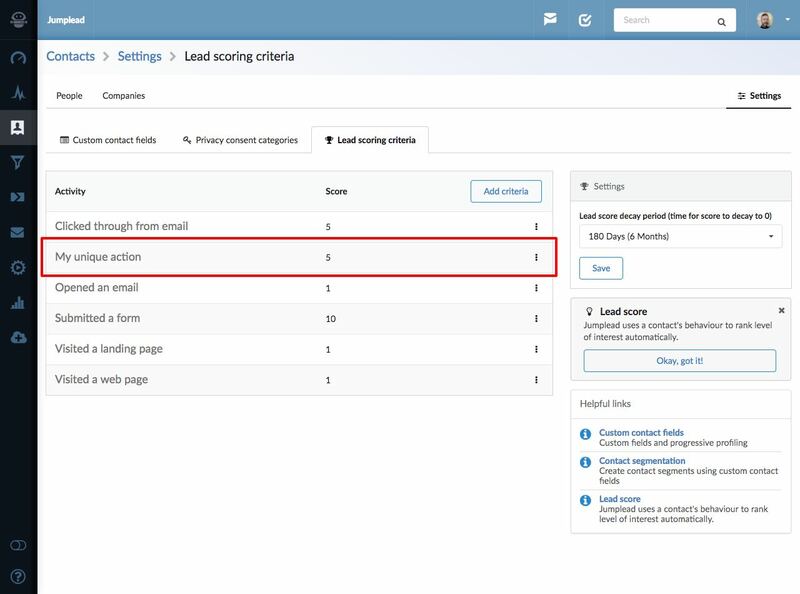 Lead scores can be seen for each contact as part of their avatar icon and contact's can be sorted by their lead score in the Contacts CRM. Lead scores are increased when your contact engages with you and then slowly decreased over time. To give you an understanding of your most promising contacts at any point in time. 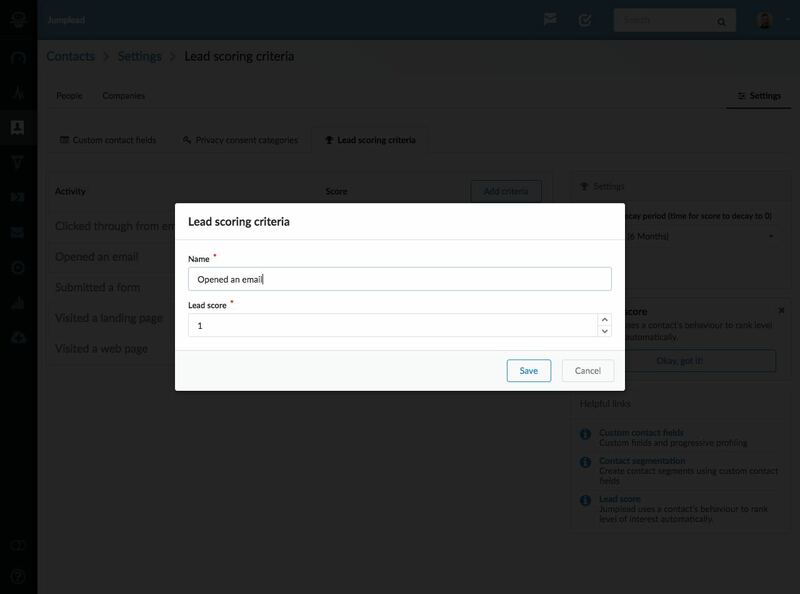 Lead scores are available for you to manage in the Settings page for Contacts. These come with default score values, but you can edit and adjust these to suit your own needs. Jumplead will automatically decay the lead score values associated with your leads so that recent activity has the highest value. You can adjust the decay period on the right hand side of the page, setting the time it will take for a score to decay to 0. This gives you the flexibility to make sure the scores your leads have relate more closely to how valuable they are to you at any point in time. One of the more powerful features of Jumplead is the ability to adjust a lead score with an automation. This is done by adding your own criteria to the list and giving it it's associated score, and then triggering your score change with an automation from elsewhere is Jumplead. Click the 'Add Criteria' button to get started. 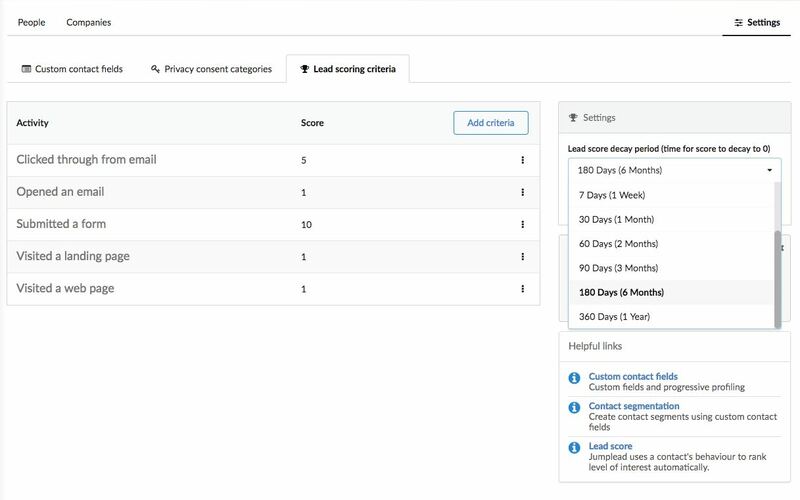 Simply create and save your custom lead score criteria and you'll see it in the list. It is now available to be triggered by any Jumplead automation. This allows you infinite flexibility to adjust scores based upon specific URL visits, unique landing page and form completions etc. 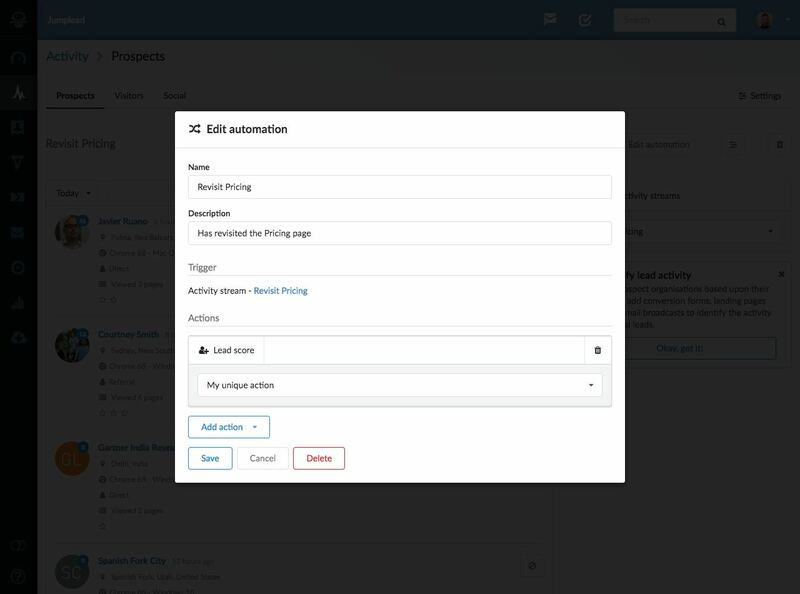 Here is an example of updating the lead score in an automation based upon a visit to a Pricing page. 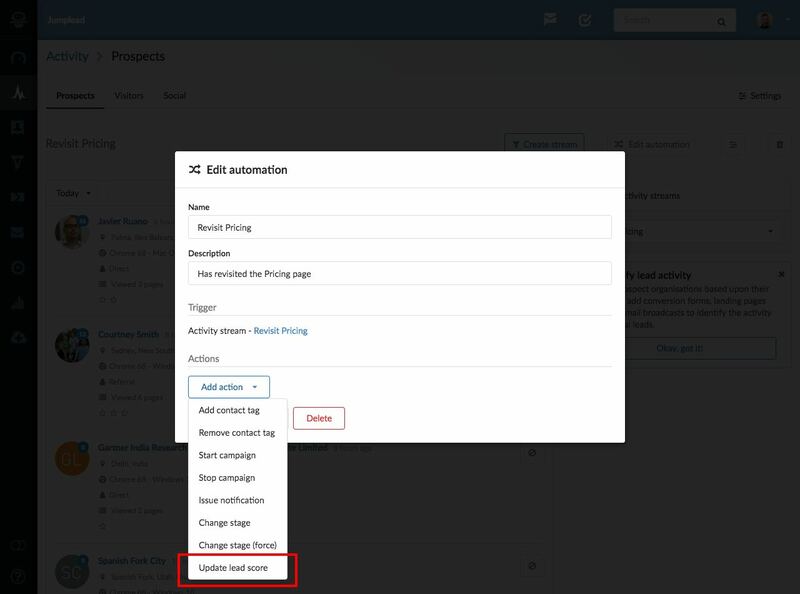 Once you have chosen the 'Update lead score' as an action for your automation, simply pick the lead score criteria you wish to apply. 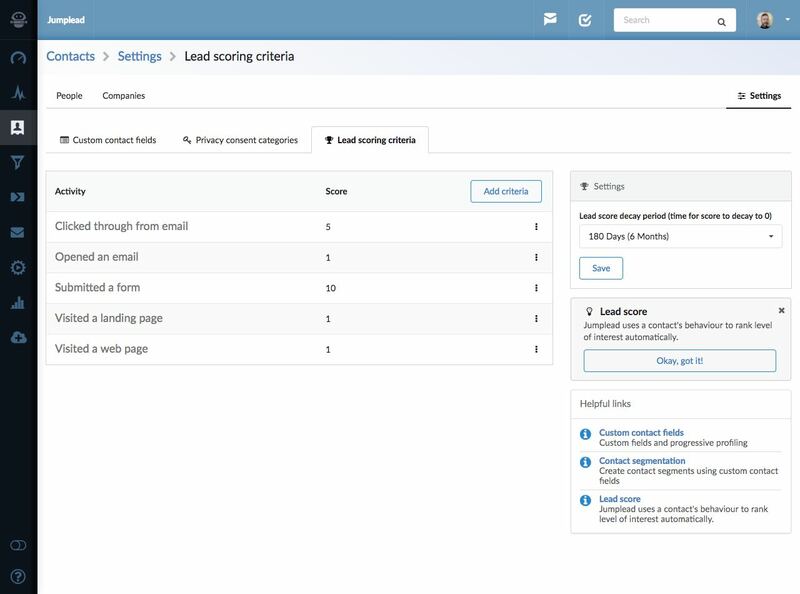 Now when a contact visits the Pricing page their lead score will be incremented.